“There is going to come a time when people won’t listen to the truth, but will go around looking for teachers who will tell them just what they want to hear. They won’t listen to sound doctrine but will blithely follow their own misguided idea.” That is the quote that best represents the issue we have with abortions still being legal. On January 22nd, 46 years ago, the Supreme Court of the United States issued its decision, known as Roe v. Wade. This decision has led to the legalization of abortion in all 50 states in the U.S. As a result, more than 60 million preborn babies, HUMAN BEINGS, are not with us on earth today. 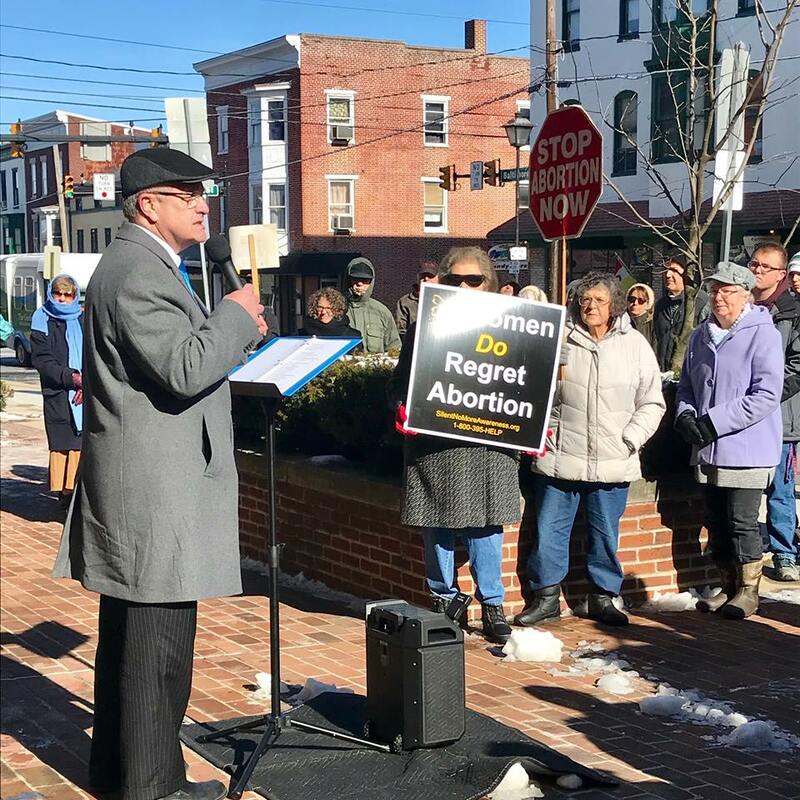 On January 22nd, 2019, citizens of Gettysburg gathered outside the Adams County Court House on a cold winter day, standing for one goal, one purpose, for Life! With an audience of about 70 people, Executive Director Michael Ciccocioppo along with two others, gave the most humbling, heart-warming presentation that these people needed to hear. The first speaker to start things off was John Santino, the husband of Ruth Santino, the Adams County Chapter, Pennsylvanians Humans for Life President. John began by giving his greatest appreciation for people coming out and talked about what it meant to be standing in front of the courthouse on that date. John reminded people that by standing up for what you believe, your voice can be heard by not just the people you are around, but by those beyond the crowd. But the most important voice to be heard throughout this rally was Pennsylvania Pro-Life Federation Executive Director Michael Ciccocioppo. His story is poignant, with his parents only being seniors in high school when they found out they were pregnant with Michael. Both of their families were very church-going people. They both were scared and ashamed, because they knew that their families would have found their behavior unacceptable. So what did they do you may ask? Well they had decided to keep it a secret from their families and once they had graduated from high school, they drove down to Hagerstown, Maryland and got married. Six months after that, Michael was born into this world! If his parents had aborted Michael and split up, Michael would’ve been a statistic–one abortion, and then that also would’ve meant that Michael’s other 14 siblings wouldn’t have existed as well. Michael proposed the idea to the crowd why they all have gathered on that day: to be a visible witness to the tragedy of so many lives lost in our society. Overall, I thought the rally in Gettysburg was a success for those who attended and also for those on the street who heard the words of these amazing spokesmen and decided to stay and listen to what they had to say. The other thing that caught my attention was the number of different age groups and genders surrounding the courthouse. Seeing children as small as about 6 years old to elders about age 70 is incredible to witness; viewing them listening to these speakers and seeing their eyes so focused on the spokesmen is such an experience! Michael ended his talk on this note: “Our cause is a righteous cause. Our minds are smart enough to understand the science of human life. Our eyes can see the uniqueness of every human being from conception to natural death. And our hearts cry out for those who cannot cry out from their mothers’ wombs: STOP THE KILLING. PROTECT INNOCENT HUMAN LIFE. STOP ABORTION NOW”.